The year is 2575, and two rival megacorporations are at war over a planet that’s little more than an ice-covered speck at the edge of the universe. Too bad nobody thought to warn the people living on it. With enemy fire raining down on them, Kady and Ezra–who are barely even talking to each other–are forced to fight their way onto one of the evacuating fleet, with an enemy warship in hot pursuit. 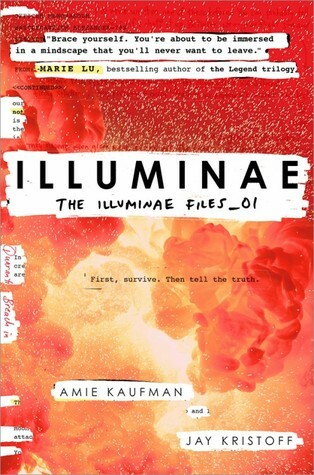 Told through a fascinating dossier of hacked documents–including emails, schematics, military files, IMs, medical reports, interviews, and more–Illuminae is the first book in a heart-stopping, high-octane trilogy about lives interrupted, the price of truth, and the courage of everyday heroes. I can assure you that you’ve never read a book like Illuminae. It’s a story come alive—an experience. Unfurling in an innovative format consisting of hacked emails, messages, medical reports, diary entries, schematics, dossier files and more, Kaufman and Kristoff craft a reading experience not only drastically distinct, but entirely evocative and spellbinding. Illuminae is arguably the best book I’ve read all year, and decidedly extraordinary. The genius of the novel is multitudinous. It’s the beautiful format, the poetic prowess, but it’s also the way the story evokes such a wide range of emotion. From horror to heartbreak, from suspense to shock, to love and grief, the story’s plot arcs, twists and turns in unexpected ways that make it impossible to put down. And despite the non-traditional format, the story moves surprisingly seamlessly, seeding clues and foretelling what’s to come in this epic interstellar tale. Our story begins with an attack on a small planet at the edge of the universe—Kerenza—a quiet, but illegal mining settlement. BeiTech’s brutal attack massacres thousands, while some survive by escaping onto science vessel Hypatia, freighter Copernicus or battlecarrier Alexander. After breaking up that morning, Kady and Ezra collide in the chaos while trying to escape, each boarding different vessels. Kady is a defiant, pink-haired seventeen-year-old girl with an aptitude for hacking, while Ezra is a courageous, but soft-hearted almost eighteen year old with divisive family secrets. Kady and Ezra hack their way through the system to communicate via messages across the void. Over the course of months, thousands perish, a mysterious illness breeds, an artificial intelligence comes to life unimaginably, and the war between two mega corporations intensifies. It’s only a matter of time before BeiTech’s vessel Lincoln catches up to them all, and erases every breathing trace of what happened. Moreover, Kady and Ezra’s dangerous sleuthing uncovers disturbing information that forces them to take action. Nothing is quite as it seems and they quickly realize their lives will likely end, atomized amongst the stars. Holding onto a sliver of hope—and each other—Kady and Ezra race against the clock to figure out how to save those who remain, and how to survive—if only to tell the truth of what’s transpired. For those of you who aren’t scifi readers and thus hesitate to read this book, dismiss your concerns. While this tale is indeed epically galactic, the story is about so many things. It’s about love, bravery, curiosity, truths, secrets, war and decisions that change the course for thousands. I laughed out loud, I furiously flipped pages, and by the end, tears streamed down my cheeks, even as my heart hammered with the fallout foreshadowed in the sequel. This is just simply an amazing book to experience, one I urge anyone and everyone to pick up. THIS is the book you’ll be talking about all year.